There are so many times that I’ve waited to see a piece of art that I’ve heard so much about, only to be completely underwhelmed when I finally get to see it. Not that I’m not happy to have the opportunity to see great art, but sometimes I am left wondering how art is judged and how greatness is achieved. And then there are other times when I am completely caught off guard by how beautiful a piece of art is, when I had absolutely no expectation of it at all. 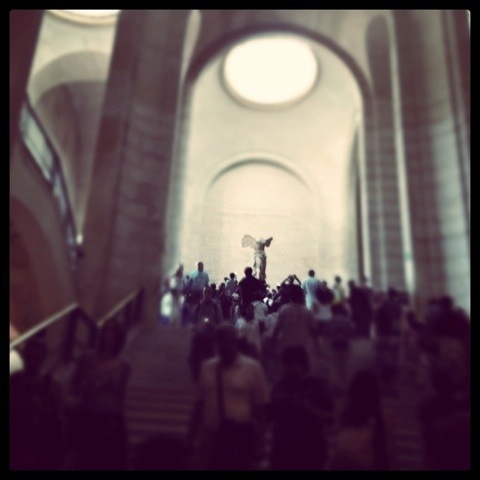 That was how I felt when we saw the Winged Victory of Samothrace (see at a distance above) at the Louvre last week. It was nearly impossible to take my eyes off of her. I realize that she has no head and no arms, but because of her lack of parts, she seemed very mysterious. Like someone you’d like to know more about. And you can see by the picture that I wasn’t the only one who had a hard time taking my eyes off of her. We showed up at the Louvre for “free museum day,” which happens the first Sunday of every month. Not totally sure I would recommend this, because what you don’t pay in admission, you pay by waiting in a giant line with all the other geniuses who thought they were getting a deal at “free museum day.” But we got in eventually and had a great time. At the Louvre, we stopped by to say ‘hi’ to the Mona Lisa, painted by one of my favorite guys Leo and she met all expectations. Ok, so she’s smaller than you would hope, and behind bulletproof glass, and there are about a billion people standing in the way of a clear visual on her, but I could tell she was looking right at me. I just know it. She may have even winked. This entry was posted in culture, museums, paris and tagged free museum day, louvre, mona lisa, paris, winged victory of samothrace. Bookmark the permalink.